Screenwriter J.D. 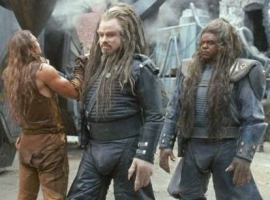 Shapiro, like most of the world, didn’t like the John Travolta-starred Battlefield Earth. Of course, where Shapiro is different from everyone else is that he’s the guy who wrote the movie, at least from a technical standpoint. He tells the story behind what is widely seen as the worst big-budget movie ever made in an incredible mea culpa article in the New York Post. It’s incredibly rare to have someone dish about behind-the-scenes problems with movies in such a public manner. It’s even rarer to see someone fly in the face of such a powerful group like Scientology. I guess Shapiro really wants to distance himself from the end product that has his name attached, or just doesn’t care anymore about reviving his career in the traditional sense. I can’t say I blame him, though; I’d want to distance myself from the end result of my Battlefield Earth script, too. That movie was terrible! All parties involved should be ashamed of themselves (or at least be willing to laugh at how terrible their movie was).